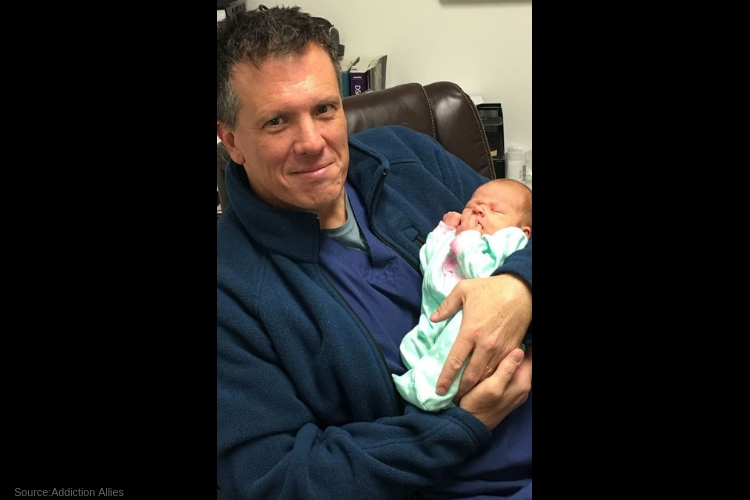 Dr. Christopher von Elten, co-founder of substance abuse and counseling clinic Addiction Allies, holds the baby of a recent graduate of the program. A local clinic in Charlottesville has become the first in the state to offer a specified treatment program tailored to pregnant women trying to break addictions before they give birth. Elten explained A lot of medical experts and rehabs are opposed to offering medications to pregnant women struggling with addiction to opioids. It can be “burdensome” for providers to navigate necessary regulations. However, Addiction Allies’ program-which combines classes on nutrition, family and health care with a team of not only medical experts but also gynecological doctors. The model aims to approach addiction and recovery as a safe and empathetic experience. The organization is pleased to announce and share its first graduated student, who recently just gave birth to a healthy and beautiful baby boy. A report conducted in 2018 by the Centers for Disease Control and Prevention states the number of pregnant women with opioid use disorder quadrupled between 1999 and 2014. Nearly 100 infants per day are born with neonatal abstinence syndrome, where babies react to opioid withdrawal with tremors, poor feeding and breathing, or seizures. The normal way of treatment for pregnant women addicted to painkillers, heroin or fentanyl is to get them into medication-assisted treatment, usually by combining methadone or buprenorphine with a comprehensive treatment plan. Buprenorphine (typically known as Suboxone) limits the effects of physical dependency and withdrawal from opioids, fulfilling a person’s cravings in a safe environment and reducing the risk of relapse. But, even with medication-assisted treatment plans some babies still experience withdrawals. However, to avoid passing their addiction, some soon to be mothers want to eliminate the medication completely, although this places the mother and child at a greater risk if the women relapse. The clinic will make sure that when women give birth they have a plan-of-care sheet to show a social worker- stable housing, transportation, medical care, and income all planned out in neat handwriting, showing it is safe for the baby to go home with mom. Being there every step of the way is something the clinic will promise every mom that attends their treatment programs. According to Addiction Allies, they will begin a brand-new class of expectant mothers very soon; with hope to enroll seven women at a time and build lasting relationships that will remain in touch and continue to support each other’s recovery. The cost can be covered by Medicaid and most health insurances. Through its Addiction and Recovery Treatment Services program, the state of Virginia has improved access to substance abuse and counseling services.